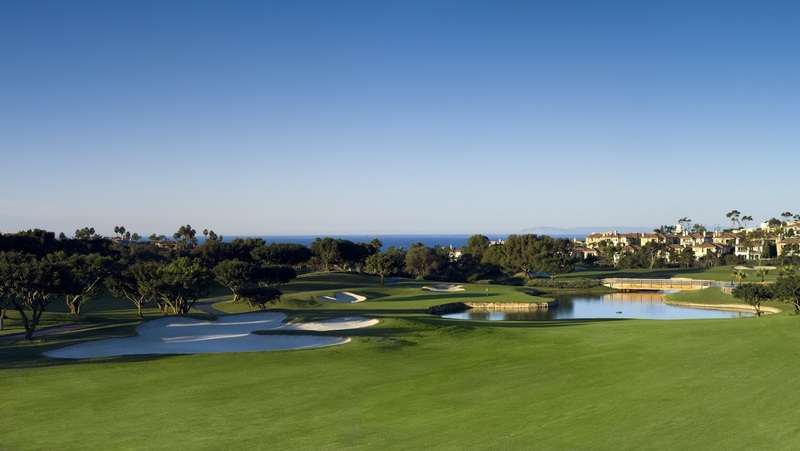 The weather of Southern California may be the best year round weather in the U.S. Just a few miles from renowned Laguna Beach, with its great restaurants and art galleries lies the St. Regis Monarch Beach Resort. Come for the fabulous weather and to frolic by the sea and experience some wonderful golf at the Monarch Beach Golf Links. Where did it get it’s name? This used to be a breeding ground for the Monrach butterflies and during your round here you are certain to encounter a few yourself. But their presence is just an added bonus to your round of golf here. Monarch Beach is 6,645 yards from the tips par 70 designed by Robert Trent Jones Jr. that was built as a 9 hole course in 1983. 8 years later the other 9 was added. The two nines couldn’t be more different. But thats a good thing. The luxurious St Regis hotel followed in 2000 making it a complete and luxurious place to stay and play. There are five par-3’s and only two par-5s, and the most visually intriguing holes here at Monarch Beach are the par-3’s..
612 yard Number seven is the only par-5 on the front nine and is the number one handicap. My experience is that it is rare indeed to see a par-5 as the number one handicap hole. The clubs pro, Jackie Kazarian, thinks its the hardest hole in all of Orange County. Thats hard. On a clear day, which it wasn’t today, you can see the Pacific Ocean from every tee box, however numbers 3 and 4 are the only two holes that actually play oceanside. Jackie told us the first 5 holes are called the Ocean loop and the next 4 hole are called the Canyon loop. I can see why. We clearly went from the ocean to playing in a Canyon. Even with the drought, the course was in wonderful shape today, especially the greens. The bunkering is a work of art in itself and they were wonderfully playable (don’t ask me how I know, just trust me). The greens were in outstanding shape and running at almost 11 on the stimpmeter. So staying below the hole is a key strategy here in your approach shots. Most good greens that I play are some advanced form of Bent grass but these are Poa Ana. My experience is that most greenskeepers spend frustrating amounts of time trying to keep Poa Ana off of a golf course, but these greens were wonderful. Go figure. Even though the front nine has 2 oceanside holes the back 9 is by far the most intriguing, with water and expansive views. Number 13 is a stunning par 3 played from a tee box 60-80 feet downhill to a green surrounded by water on three sides and sand on the other. Even though most of the holes lay out visually in front of you on the tee box there are many times you need to know distance to a sand trap, hazard or layup spot. The carts have the latest in GPS technology with touch screens, so that you can touch your target on the screen and instantly see its distance. If you prefer your information from people, then try their Waterman forecaddie program where one of their highly trained caddies will assist you the entire round. They don't have a driving range but they do have 4 hitting bays into nets that allow for an adequate warm up. On tournament days they set up the first fairway as a driving range and pick it clean just 10 minutes before the shotgun goes off to start the tournament. Voila, from driving range to first hole. 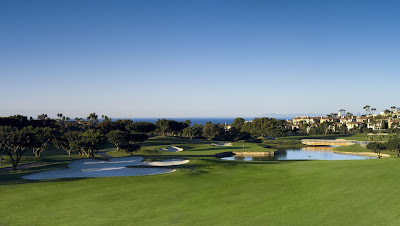 Monarch Beach Golf Links is semi private and is avail for public play. They also have stay and play packages with the luxurious St. Regis hotel on property. If you love your golf equipment as much as you like your golf, then plan a day to visit Carlsbad, CA just 30 miles down the coast where almost all of the major golf equipment manufacturers call home. July and August are pageant season here in Laguna Beach, and that means performances every night of the Pageant of the Masters. where well known paintings are brought to life on stage by real live people. and quite a spectacle it is. I don’t know how they do it but its like magic. If you want to see the pageant while you are there get your tickets early. This 3,500 seat venue sells out almost every night. If you are looking for more family activities in the area just down the road 30 miles is Legoland— Yeah I said Legoland. Where everything is made from legos: elephants, giraffes, The Sydney Opera House, The Statue of Liberty, the Eiffel Tower and even the NY skyline. They are made by “master builders” If a day of legos isn't enough for you— then you may want to stay on property in the Legoland hotel—- I guess you can sleep with legos and maybe have your meals with Legos.. At over $300 per night this hotel is regularly sold out but the rooms are all themed and if you love legos, this is the place for you.